Chicken and broccoli, what a delicious combination. Whoever decided to slather chicken and broccoli in teriyaki sauce and combine the two together over rice was a dang genius. This recipe is the type that you can make in a pinch, if you make your butternut squash rice in advance. 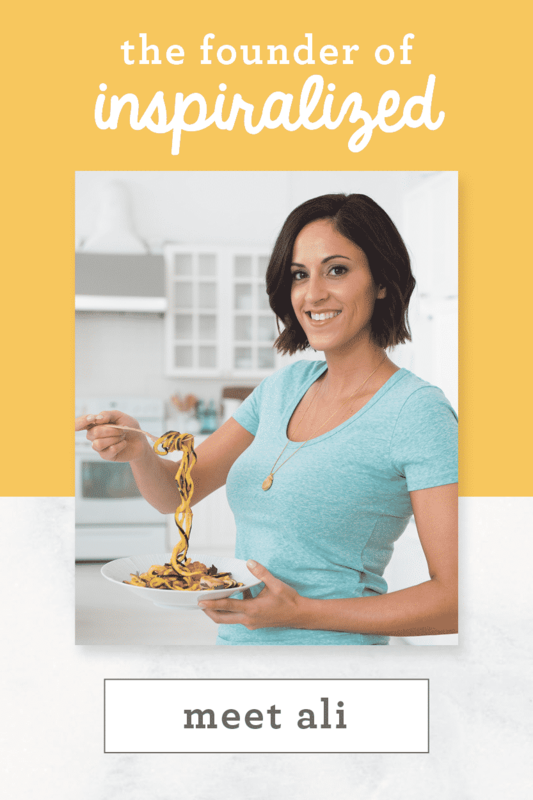 It’s easy to whip up and has so much flavor. Plus, it doesn’t have the heavy carbs and calories that regular rice has. It’s easy to get carried away when you order takeout. 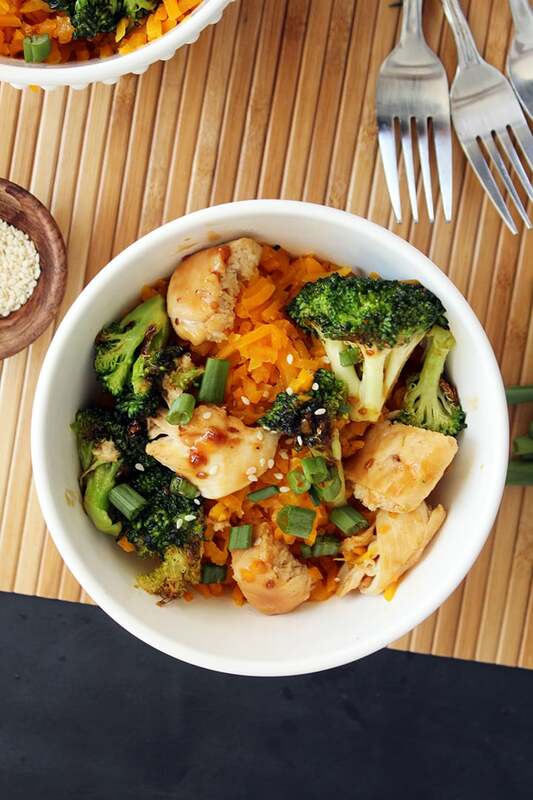 Whether it’s lo-mein or even brown rice, it’s not hard to devour an entire carton of it. I’ve been guilty of it, because teriyaki sauce is so amazing and pairs so perfectly with rice or noodles. Every scoop is addictive. 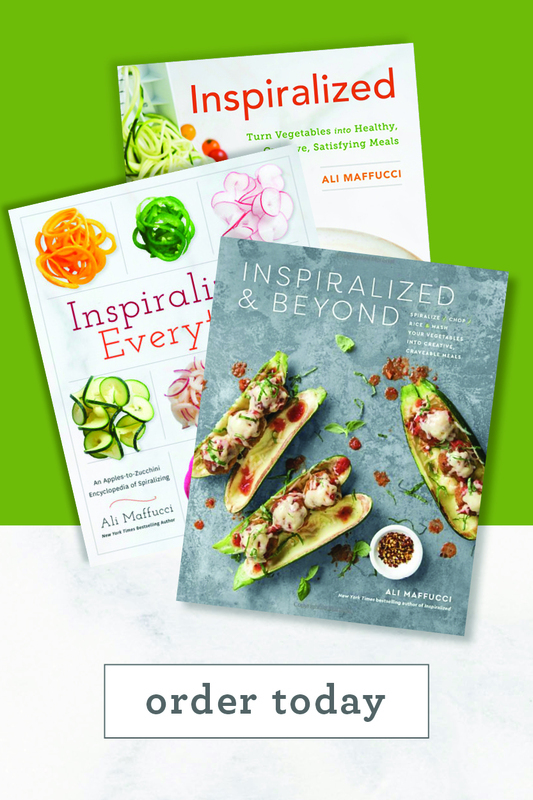 Well, now that we’re Inspiralized and we have rice made of vegetables, we can still devour that carton – and still feel good. For this recipe, I actually used my favorite teriyaki sauce by Annie Chunn’s. This makes the dish even quicker! By baking the chicken in the oven, the teriyaki sauce really seeps into the skin of the chicken and makes each bite with rice that much more rewarding. 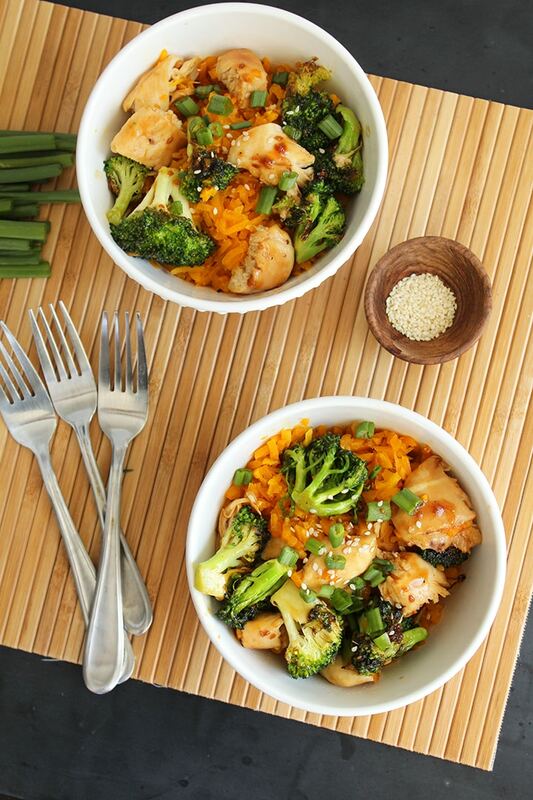 The broccoli and chicken are mixed together in the end with a bit more teriyaki sauce to create a sauce that gets poured over the butternut squash rice. Every time you dig your fork (or chopsticks!) into this bowl, you’re going to get a sweet and savory kick. This dish makes Friday nights in with a movie so much better. 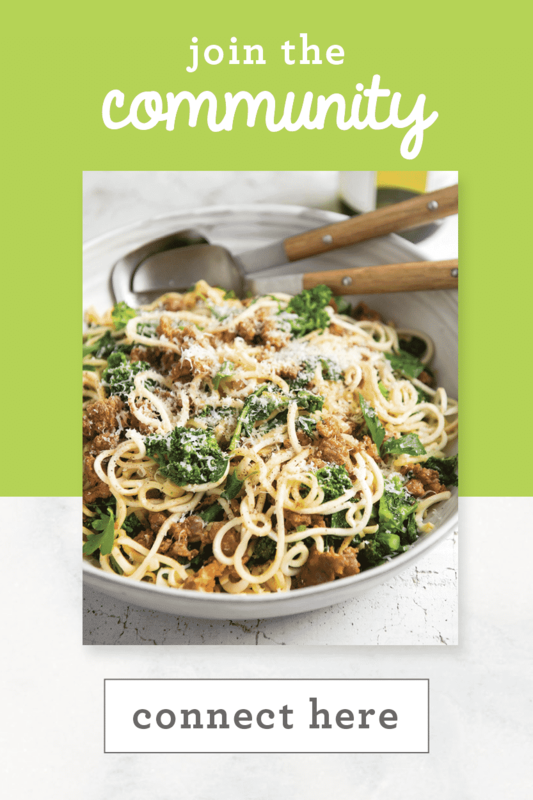 Plus, you can make a big batch and have leftovers the next day for lunch! What’s your favorite brand of teriyaki sauce? Preheat the oven to 350 degrees. Place the chicken breast tenderloins on a baking tray and smother in teriyaki sauce. With your hands, massage the sauce into the chicken. Let rest until the oven is preheated and then bake for 15-17 minutes or until chicken is white on the inside, no longer pink. Set aside when done. 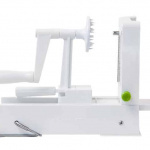 Place your butternut squash noodles in a food processor and pulse until the squash is made into rice-like bits. Set aside. Place a large skillet over medium heat. Add in 1 tbsp of coconut oil. Then, add in the garlic. Let garlic cook for 30 seconds and then add in the butternut squash rice. Stir and cook for about 2 minutes and then add in the chicken broth. Stir and let reduce. Once the broth reduces, taste. If the rice is still crunchy, add in another 1/4 cup and let reduce. Taste and repeat with more chicken broth, if needed. When done, add in the soy sauce. 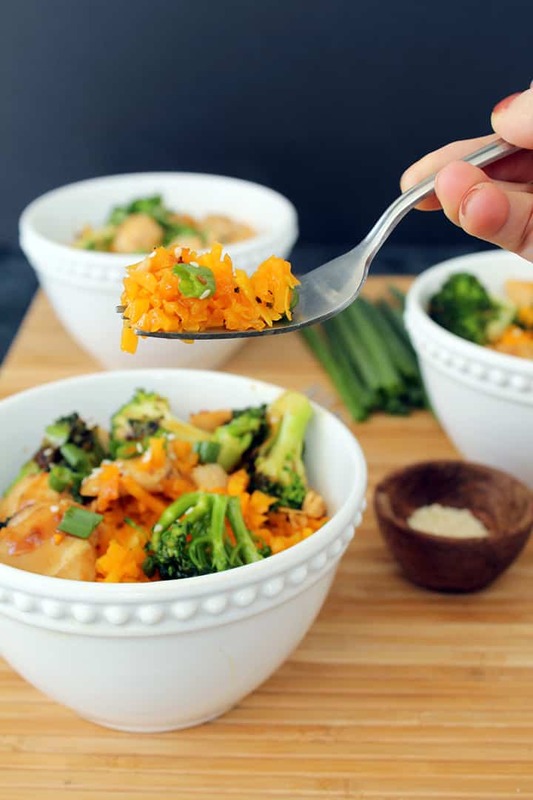 While you start to cook the rice, place a medium skillet over medium heat, add in 1 tbsp of coconut oil and add in the broccoli. Cook, tossing occasionally for 5-7 minutes or until broccoli begins to brown on sides. When the rice and chicken are done, add the chicken to the broccoli skillet and turn the heat back on. Add in the remaining teriyaki sauce and mix together for 2 minutes to heat up the broccoli. 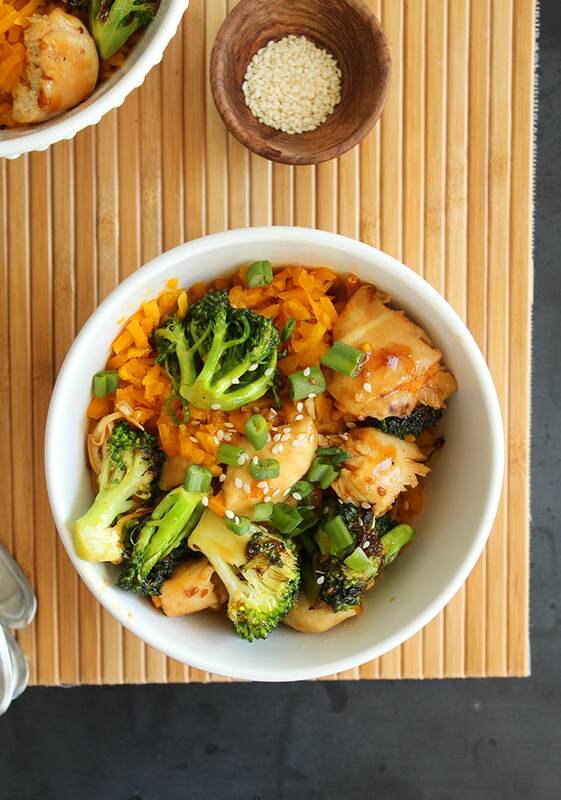 Portion the rice out into 4 bowls and top with broccoli and chicken. Garnish with scallions and sesame seeds! This looks so refreshing especially after my weekend of gluttony! 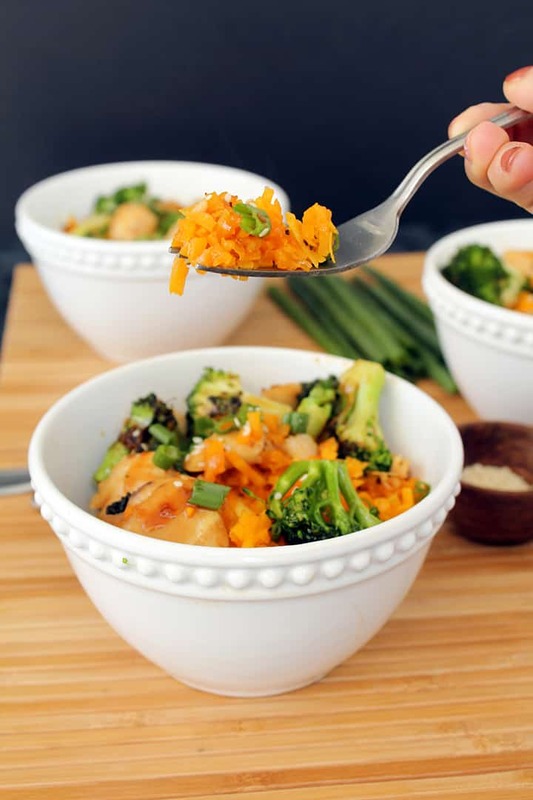 How much butternut squash rice to you use? How do you make it? I made a chicken and broccoli stir fry on Saturday. The butternut squash "rice" would have been perfect with it! I just substitute my homemade version of a teriyaki sauce. Are you concerned by the Wheat in the teriyaki ssuce?? Yes. Most teriyaki sauces are made with soy sauce. I make mine with tamari. Steven, this isn't a gluten-free recipe, sorry for any confusion! I love teriyaki chicken! This looks delicious! Made this last night. My family loved it!!!! We also added some sliced water chestnuts to the dish. Straw mushrooms would be good too. Would definitely make it again! Thank you !! It's really delicious, you have to try! Hi Ali, My co-worker introduced me to your blog. 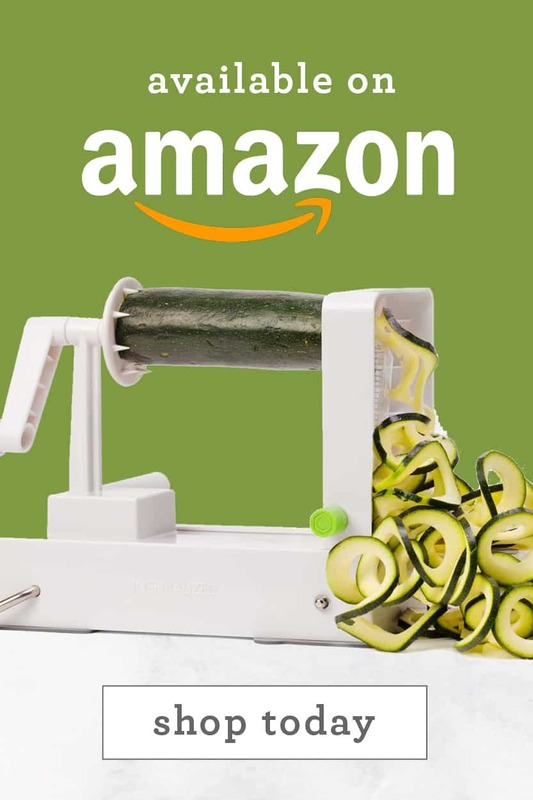 She was so excited about what she had been making that I ordered my spiral veggie slicer to be delivered the next day! I made this dish last night and loved it! I also added a little sesame oil the recipe and it gave it a great flavor. 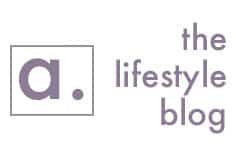 Keep blogging, Girlfriend! 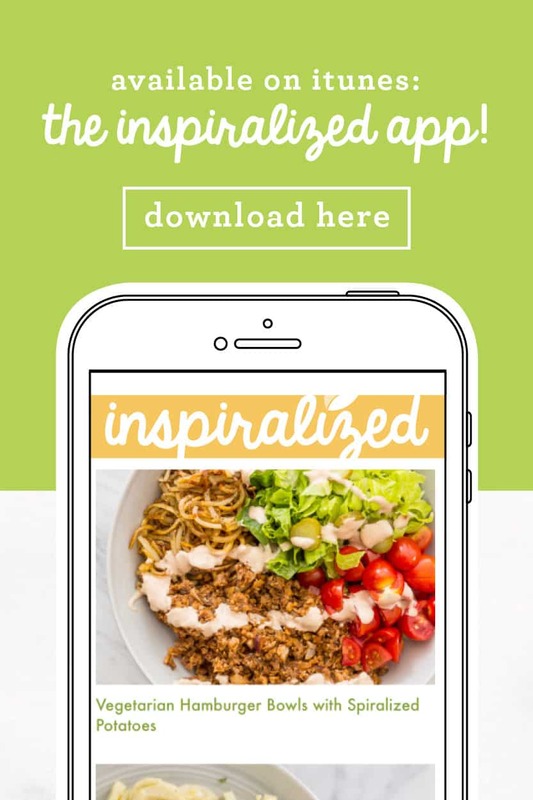 You have Inspiralized me! Loved loved loved this! We only had boneless chicken thighs and it made for great chicken chunks in this dish! 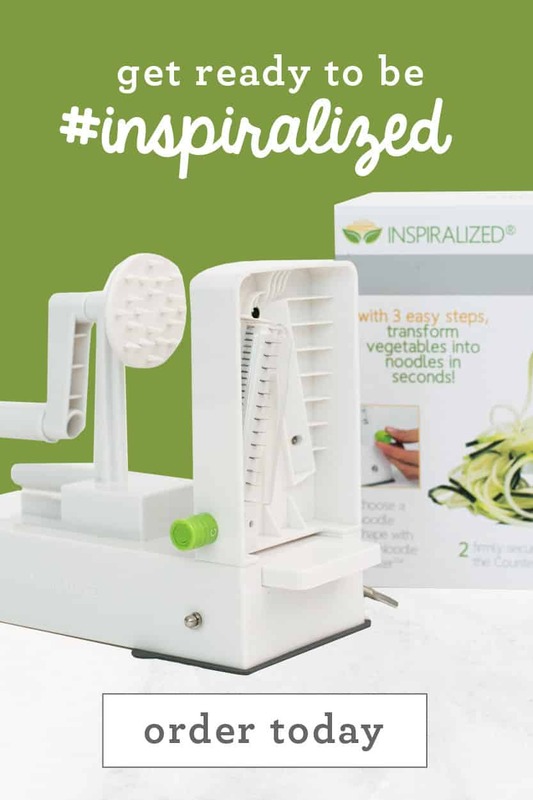 How fun to spiralize so much of what we eat and get the kids excited about it all! This was delish!